George Sanders, the foremost expert at portraying cinema's wittiest and most charming cads, is perfectly cast as Georges Duroy in the 1947 melodrama The Private Affairs of Bel Ami, a toned-down adaptation of Guy de Maupassant's novel Bel Ami by writer-director Albert Lewin (The Picture of Dorian Gray). "The history of a scoundrel" is de Maupassant's original subtitle for his novel, and fittingly the film charts Georges's rise through 1880s Paris scoiety, as an unrepentant social climber and maltreater of naive women, with a calculated coolness that reflects the attitude of its anti-hero. Try not to be turned off by the few unpromising opening scenes, which are burdened by heavy exposition delivered with motor-mouthed dexterity (surely, the idea was to make these necessary scenes go by breezily, but the inverse ends up being true). The facts we must know are these: Georges is a down-on-his-luck ex-soldier who has a distaste for rich people (and, let's be honest, women). 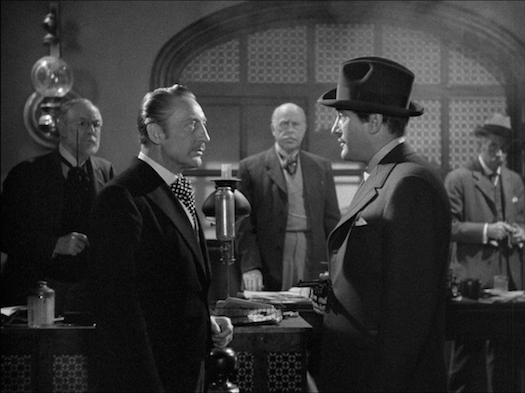 He meets up with an old army buddy, Charles Forestier (John Carradine), who is making good money as a newspaperman so he offers to put in a good word for Georges with his boss. Charles invites Georges to a dinner at his boss's home and even lends him some money to buy proper dinner attire. 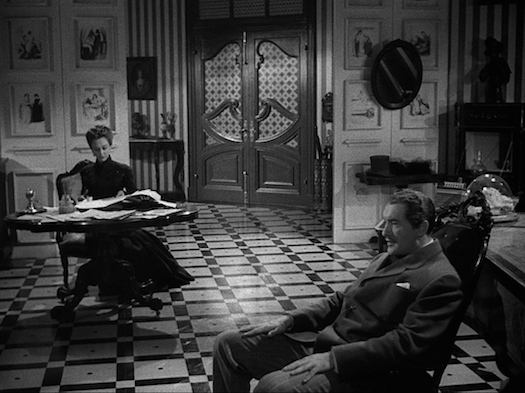 Georges succeeds in impressing the head of the paper, Monsieur Walter (Hugo Haas), and catches the eye of a young widow, Clotilde de Marelle (Angela Lansbury), in the process. Once Lansbury appears -- looking shockingly young, to a viewer raised on Bedknobs and Broomsticks or Murder, She Wrote -- the film gets down to business. Clotilde falls madly in love with Georges -- and he feels something for her too -- but Georges's eye is caught more firmly by Charles's wife, Madeleine (Ann Dvorak). Not that he wishes his buddy to come to any harm, but Charles's hacking cough gives Georges a reason to contemplate pursuing the charming (and, above all, cunning) Madeleine should Charles happen to die any time soon. Clotilde is not blind or stupid about Georges's feelings, but she admits to him that she is too madly in love with him to try to change his ways. Little does she know, Georges is just getting started. In an attempt to get ahead at the newspaper, Georges goes after his boss's wife, Madame Walter (Katherine Emery). This somewhat backfires on him because, while he tries to keep their fling sedate, Madame Walter becomes jealously attached to Georges. His mysterious appeal also works its magic on the Walters' daughter, Suzanne (Susan Douglas). As if that wasn't enough hearts to juggle, Georges also makes a play for Marie de Varenne (Frances Dee), the wife of an esteemed blind composer. Director Lewin's style is far from flashy, although the cinematography and production design, by studio pros Russell Metty (Ride the Pink Horse) and Gordon Wiles (Gun Crazy) respectively, give the film a sumptuous period flavor. Lewin's most striking sequence is the nailbiting climactic pistol duel between Georges and a man who claims Georges has stolen his family name; all of the schemes and deceptions Georges has built hang in the balance over his ability to shoot first and be deadly enough that the other man cannot return fire. I won't spoil it, but I will say that the duration of the sequence makes it surprising and worthy of study by filmmakers today. Even with this abundance of creative riches, the performances are the real attraction here. Sanders is quite bold in his choices, often playing Georges as bluntly cold and yet never appearing less than magnetic. Lansbury is the soul of the film, and her sympathetic roller coaster of emotions as she is elevated and torn down by Georges's actions guides us as we form our own visions of this unrepentant scoundrel. Dvorak shapes Madeleine into a near-mirror-image of Georges, a being who values her wit over her heart, able only to tip her hat and give the devil his due when she inevitably falls victim to his schemes. Considering its lack of reputation over the years, The Private Affairs of Bel Ami is a delightful surprise. 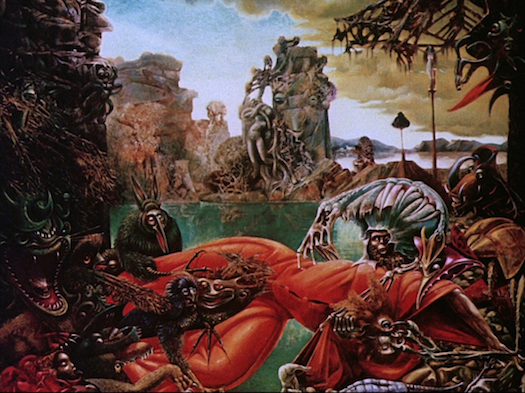 As with the rest of the images, it is richly textured and striking. Olive has surely lucked out this time around, with this excellent transfer. The DTS-HD MA 2.0 mono audio track is nicely preserved. Certain passages have a subtle hum or hiss, but I only noticed it because I listened to about half of the film in headphones. Otherwise, the dialogue, ambience, and musical score by Darius Milhaud are all cleanly reproduced with satisfying depth. Now, the frustrating part. Now and again, someone in the cast -- usually Sanders or Carradine -- would speed through a line of dialogue, and I would be inspired to switch on the provided English SDH track to see what they said. The subtitles would often come back to me with this gem: "(mumbles)." But here's the real frustration: while rewinding the film to see the subtitles, I would inevitably hear the line again and then figure out what the actor said. Having been an intern who created subtitle files for a video distributor for no pay, I have a deep suspicion that this subtitle track was created by a low-paid/unpaid intern like I once was, with no oversight. Whenever a French phrase comes up, the poor subtitles typically resort to "(mumbles)" or some inappropriate English word that doesn't make sense in context. Whoever made these subtitles has never heard the word "Hussar," and as Georges belonged to the Sixth Hussars, it comes up quite a bit in dialogue. "Do you remember our days in the Sixth (mumbles)?" "Ah, I have fond memories of the Sixth (mumbles)." Sadly, some fairly easy English phrases get butchered too. Many Olive Films releases lack subtitles; if this is the quality of transcription they are going to provide, they should probably go back to leaving them off. An outstanding new transfer of this little-remembered but worthy literary adaptation. 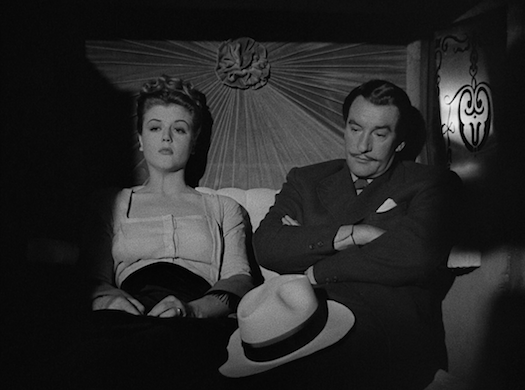 George Sanders is at his oily best, and Angela Lansbury is a youthful revelation. No supplements, but the film stands proudly on its own. Highly Recommended. Justin Remer is a filmmaker, oddball musician, and frequent wearer of beards. His new single, "Bop Shoo Bop," is now available to stream or download on Bandcamp, Spotify, Amazon, Apple, and wherever else fine music is enjoyed.